At about this time last year I had an idea that I thought would help people make lasting changes in their lives. I called it The Year of No. The idea took hold with some folks, myself included, but my life took a very hard turn last winter with my son Zekey’s health, and I quickly lost focus of everything except for him. When he went home to Jesus in March, my family was devastated, and the rest of this year has been spent adjusting to our new normal. Losing my son has been traumatic, and I will walk with a limp for the rest of my life. But Zekey has also inspired me to try to become the best version of myself I can be, and that’s what The Year of No is all about. So as 2015 stares us in the face, I want to give this thing another shot. Here’s what I wrote about it last year. New Year’s resolutions are a great idea. The start of a new year is the perfect time to make important changes in your life, changes that will help you to become the person you want to be. A healthier diet. Regular exercise. Reading the Bible every day. All of these are important things that will shape your character for the good. The heart of self-discipline is the ability to say “No” to the wrong things so that you can say “Yes” to the right things. At the heart of almost every resolution is the issue of self-discipline, and the heart of self-discipline is the ability to say “No” to the wrong things so that you can say “Yes” to the right things. I need to learn to say “No” to the things that steal my time, my health, and my character so that I can become the man God wants me to be. Most of us want to instill practices in our lives that make us better people. We want to form good habits and participate in daily spiritual disciplines. We want to eat better and work out more. Hence, New Year’s resolutions. But I’ve discovered, after trying this every year for about 20 years, that turning on a dime is nearly impossible. Most of us are like battleships. We need a lot of time and energy to change course. Of all the resolutions I’ve made over the years, I was only ever able to keep one of them. (I read through the whole Bible in 2011, so I’ve pretty much punched my ticket to heaven.) That’s about a 2% success rate. Yikes! Most of the people I know are close to that number with the resolutions they’ve been able to keep. All of this failure makes me want to stop trying. Maybe you’ve reached that point, too. But I don’t want to give up on change. I’m ready to try something new. New Year’s resolutions don’t work because we’re not used to living lives of self-discipline. Resolutions don’t work because we’re not used to living lives of self-discipline. It’s a me problem. I enjoy certain things in life, and have come to believe that I am entitled to them. I give myself too much permission, and especially too much cheap grace. Whether it’s eating out or sleeping in, the pleasures of life are no longer something I enjoy occasionally, but rather pleasures to which I feel entitled every day, every meal, every evening. The problem isn’t that I’m not saying yes to the right things; it’s that I’m saying yes to the tiny pleasures and distractions of life all the time, which leaves me no time to say yes to that which develops my character. What I’ve discovered is that the development of my character is won or lost in a thousand tiny decisions each day. Trying to cut out sugar, Coke, or Facebook all at once on January 1 just doesn’t work for most people. It has never worked for me. So I want to try something new, and I’d like to invite you to participate with me. The development of my character is won or lost in a thousand tiny decisions each day. I’m calling this year The Year of No. It’s not the Year of No Netflix, or the Year of No Fast Food, or the Year of No Shopping. I’m not quitting anything cold turkey. 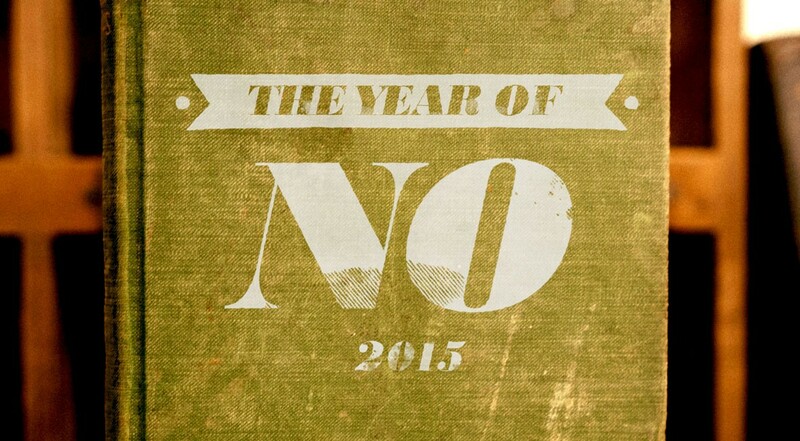 Is is just The Year of No – the year of saying “No!” to something to which you feel entitled each day. It’s the year of celebrating small victories of self-discipline and self-denial. Radical, immediate life change is very rare. More often than not, life change is a long, slow process of saying “No!” to your entitlements which then opens up space for you to say “Yes!” to the practices and disciplines that allow for character development. In Mark 8:34-35, Jesus said: “Then he called the crowd to him along with his disciples and said: “Whoever wants to be my disciple must deny themselves and take up their cross and follow me. For whoever wants to save their life will lose it, but whoever loses their life for me and for the gospel will save it.” I’m convinced that following Jesus is not a decision I make once, but is a long series of decisions I actively make everyday. It’s not a prayer I pray once, but a persistent prayer of “No!” against the entitlements, permissiveness, and temptations of my heart. You have to learn to say “No” before you can say “Yes.” You have to lose your life before you can save it. I need to learn to say “No,” but I know that I can’t learn it all at once. I’ve tried that. But maybe I can learn to say “No” one decision at a time. I don’t need to cut Twitter out of my life, but I do need to learn to say “No” when I’m tempted to scan through it eight times at work or while my kids are awake. That’s what this is about: cutting back on what is out of balance rather than cutting it out of my life completely. I know myself too well to think that I can do the latter at this point, but I remain optimistic about being able to do the former. Identify some of the things to which you feel entitled, and write them down. It could be anything. Eating out. Watching TV. Sleeping in. Drinking alcohol. Buying clothes. Facebook. Comments sections on news websites. (Okay, that one you should cut out completely!) Wherever you find yourself indulging, that’s where your entitlement lives. Identify your entitlements, write them down, and keep them somewhere you’ll see them everyday. Clarity is the first step toward victory, and writing is important for remembering. Say “No!” to one of your entitlements every day. Have a glass of water at lunch instead of Coke. Stay off of Facebook or Twitter while at work. Put your phone away when you get home and interact with your roommates, spouse, or kids. It’s not about saying “No” to something forever; it’s about saying “No” to an entitlement right now so that you can say “Yes” to something better and more important. This is how you win the battle for self-discipline: denying one little entitlement at a time. It’s not about saying “No” to something forever; it’s about saying “No” to an entitlement right now so that you can say “Yes” to something better and more important. This is not a resolution. This is not about quitting something cold turkey. This is about strengthening your will through tiny exercises of self-discipline. It’s about denying yourself in small ways every day so that you can become the person God wants you to be. If this is something that you would like to do, you don’t have to sign up for anything or even tell me. You can just start saying “No!” to your entitlements and use the hashtag on Twitter or Facebook. Then, if you see someone else doing it, you can offer them encouragement and support. Feel free to share this post so that other folks can know what you’re doing and participate, too. That’s it! That’s what I’m going to do. It’s not about tackling the whole mountain in one fell swoop, it’s about taking one step at a time by denying yourself in those moments of temptation and entitlement. I’ll be writing some follow up posts in the month of January, and I hope to have some updates to share from you about how this is becoming your year of no! Thanks Andy, a great approach and I can relate so much with your comments. Also I am very pleased you are serving in a church up there in the “holy city”! Was just up in Toledo yesterday for an aunts funeral. I have tried to say no NO more at work to be more focused and less stressed but this is simple and clearly applicable to all of life. Thanks for sharing and blessings to you, your household and the church. Thanks Joe, I appreciate your encouragement. Thanks so much for accountability that I have been seeking, and a clear vision of the way to begin again in my quest for greater self-control. Shopping is my nemesis and since retirement slashed my income, I MUST learn new habits. This morning, I have turned back from pursuing two online ads for things I do not need. Blessings and Praise God for your work and your passion for His! Lynne, that’s great to hear! All these small victories add up to something huge!